From the chrysalis of a peaceful agricultural "caterpillar" farm­ing tractor there has suddenly burst forth a most formidable offensive weapon of warfare, a death-dealing juggernaut that climbs over trenches, crawls in and out of shell craters, and knocks down anything which it may perchance encounter. American, or to be exact Yankee—for the inventor is a straight New Englander—inventive genius in inventing the cater­pillar tractor in connection with British adaptability in improving on this model and encasing the tractors in bullet-proof armor and mounting guns upon them (and the distinction for this idea has also been claimed by an American although official recognition has been given to Colonel Win­ston Churchill for the device) has given to the Entente Powers a new weapon of offen­sive warfare. 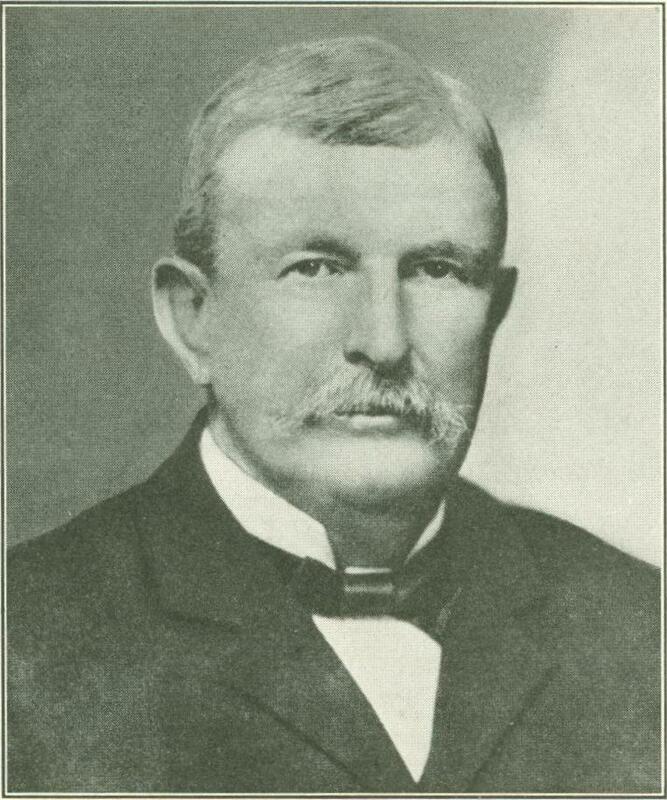 And the credit for inventing these ma­chines belongs to Benjamin Holt—the Cyrus McCormick of the Pacific Coast, as he is called—who has done more than any other one man to promote scientific farm­ing throughout the coastal states of the West by his inventions of modern scientific farming machinery. Back in the 'eighties, "Uncle Ben" Holt, for so he is affectionately termed by all who know him, was making hardwood wheels in New Hampshire—a business which he had received from his father. His older brother, Charles, had migrated some years before to San Francisco, and to him Benjamin used, to ship boatloads of wheels around Cape Horn. But when these wheels were put to use they proved unsatisfactory, for the California air would soon dry the moisture out of them and they would go to pieces easily, so Benjamin determined that the only way to avoid this difficulty lay in using native California wood, and he, too, left New Hampshire for California, where, after a short time, he built a factory at Stockton, leaving his elder brother to manage the finances while he worked out the mechanics of the busi­ness. And this latter step, that of leaving the finances to Charles, illustrates one of Uncle Ben's most striking characteristics. Once let him hit upon an idea which he considered to be of value and nothing short of an earthquake could drive him away from that idea until he had determined whether it was feasible or not. Whenever he sets to work upon an idea he refuses to be bothered with anything but the direct object in view, and everything else must be subordinated or left to others. Even to-day, well on into the sixties as he is, he invariably when he travels takes a man along with him whose duty it is to buy the tickets, plan the route, and pay the bills, leaving Mr. Holt entirely free to work upon the problem in mind. And many are the stories told of his fixity of purpose! Some years ago having just landed in New York on his return from a business trip in Europe, he determined to visit the Bowery. So, one night he set out, but hardly had he gone a block on that notorious thoroughfare before he was set upon by thugs. Fortunately his assailants became frightened and ran off before they had time to steal his wallet containing his money. After an in­auspicious prelude of this sort most men would have foregone a visit to such an inhospitable neighborhood, but Holt proceeded on his way, only to be set upon a second time by robbers who this time made off with his wallet. How­ever, undismayed, Holt found some loose silver in his pocket, sufficient for his needs, and with this continued on his tour when he was for a third time held up by another band of footpads who this time cleaned him out completely! But it was too late: he had accomplished what he had come for and had seen the Bowery! On another occa­sion the employees of his factory planned a great street parade and decided that Uncle Ben should march at the head of it. To preclude the possibility of his leav­ing town on a motor trip, all the com­pany's automobiles were conveniently put out of order. After many hours of arguing he was per­suaded to consent to lead the parade and promised to lay aside his working clothes and get "spruced-up" for the occasion. But when the time came for the procession to form, Uncle Ben could not be found. After a frantic search the committee suc­ceeded in finding him. True to his promise he was dressed in his best clothes, but he had shed his coat and with his hat tilted back over his ears and covered with grease and oil he was busy working on the engine of a new tractor in which he was interested, utterly oblivious to parades or anything else that might be going on. And his disregard of clothes is on a par with his disregard of conventions, and he is never too busy to listen to any of his employees. Once several of the Eastern directors of his company had traveled clear across the continent to be present at an important meeting, when one of the factory foremen poked his head into the room where the meeting was being held and asked for "Uncle Ben." The latter with­out any formality whatsoever immediately jumped up and went off with the foreman, leaving the directors and the meeting to take care of itself as best they might. But underneath this rugged manner he carries a heart as large in sympathy as his mind is large in business, as all his neighbors will testify, but to mention his charity to him is veritably to insult him. 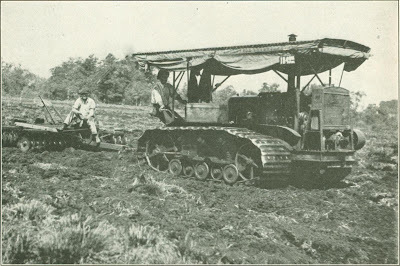 Although from the time he built his fac­tory at Stockton, Calif., Mr. Holt was continually manufacturing new farming machinery, it was not until shortly after the beginning of the twentieth century that he hit upon the scheme of the caterpillar tractor. Now Stockton stands at the head of the San Joaquin River and has a three-foot tide. Consequently a great part of the country thereabouts is so swampy as to render ordinary agricultural implements useless, so to overcome this Mr. Holt set about mounting his machines upon great wheels—wheels with a combined tread of thirty-six feet. Naturally these great engines proved too bulky and furthermore required almost an entire field to turn around in, so Holt hit upon the scheme of an endless belt which should have rails mounted on the inside, on which wheels supporting the tractors could run. And so was devised the modern tractor, or caterpillar as it is called. These tractors crawl on two belts, with corrugated sur­faces, on either side of the body of the machine. The corrugated surface is on the ground. On the inside of the belts are two lines of steel rails, making four lines in all. These rails are in short sections, joint­ed, and operate over a cogged mechanism that actually lays them down with their belt attachment as the tractor moves ahead and picks them up again, so that the car runs on its own self-made track continuously. The body is supported by trucks with five wheels on each side, like small railroad trucks. These wheels never touch the ground, but run upon the steel rails. In the ordinary tractor about seven feet of belt and rails is on the ground at one time. The treads of these caterpillars are about seven feet long and average more than a foot in width, although for work in soft marshes, such as in the everglades of Florida, where one can impale a pole eight feet into the mud by mere pres­sure of the hand, treads thirty inches wide are used, and in the big 120 horse-power caterpillars which weigh 26,900 pounds and are the type employed in the British army the length of the tractor is twenty-three feet. The machine is steered from the treads, each tread being steered separately. The forty-five and the seventy-five horse­power types (the latter used by the French army) have four cylinders, and the 120'S have six. For the first years after they were in­vented, the caterpillars were used chiefly for agricultural purposes such as hauling plows, threshing machines, loads of hay, and soon replaced the horse in this branch throughout the west coastal states. But it was not long before they were put to other uses. In the South and West they were employed for clearing out irrigation ditches. The great engine (they can sur­mount a 48 per cent. grade hauling a load) would crawl down into the bottom of the irrigation ditches, scoop up a load of dirt, and clamber up the bank again just as easily as the hippopotamus taking its ma­tutinal bath in the Nile. Up in Alaska as it laid and traveled upon its own rails it was found in many cases to be superior to the logging trains for hauling great logs, and as it could force its way through a five-foot snow bank its value was great. In Africa in many cases the caterpillars replaced the gangs of 100 to 150 husky Negroes hauling timber from the forests, and as it can pull down a tree by a direct pull it was of great value for clearing land of stumps for culti­vation. 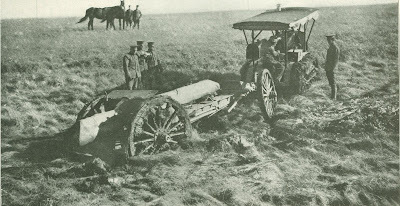 Throughout the Gallipoli cam­paign and at Saloniki the British are said to have had at least one in use for hauling big guns and ammunition trains. Indeed, before the outbreak of the war the majority of nations throughout the world possessed one or more of these caterpillars, but their significance as a weapon of war and then only as a motive power — was not discovered until after the war had begun, by Austria. At the commencement of hostilities several caterpillars were in use in the fields of Austria, and these were at once comman­deered by the Gov­ernment for pulling the great "Sko­das" or siege guns that were used for batter­ing down the forts of Liege and Na­mur. 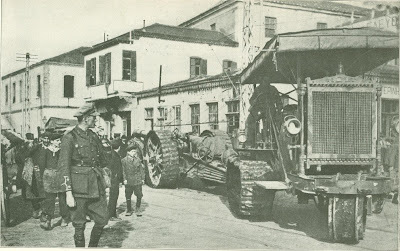 The Russians used them on the Eastern front in the Pripet marshes, and to-day Russia has ordered sev­eral exclusively for agricultural purposes, not to be shipped to the front, showing that she is already making plans for agricultural progress when once the war is over. Germany employed whatever caterpillars were in the country and obtained some from captured Belgium at the fall of Antwerp, and no doubt her skilled artisans are turning out many more copied from the Ameri­can pattern. But to the British must be given the credit for making them a real weapon of offensive warfare. 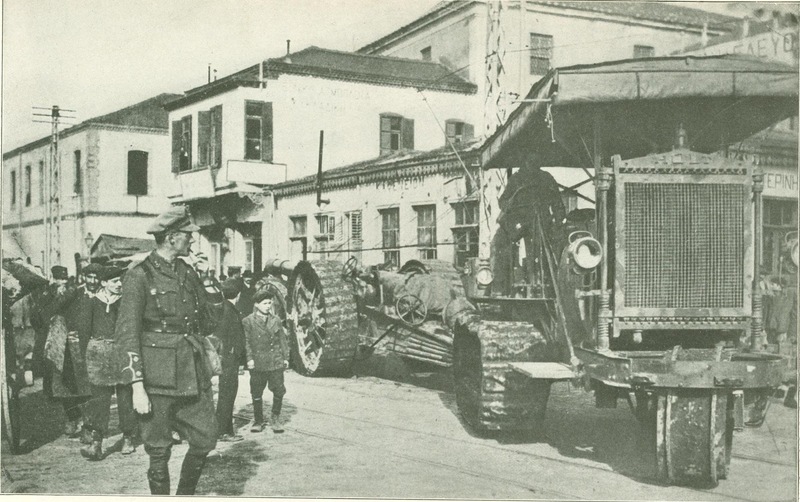 By building a tractor, the tread of which ran around the length of the car itself, enclosing them in bullet­proof armor, and mounting guns on them, they turned them into veritable land fortresses and launched them against the German trenches. 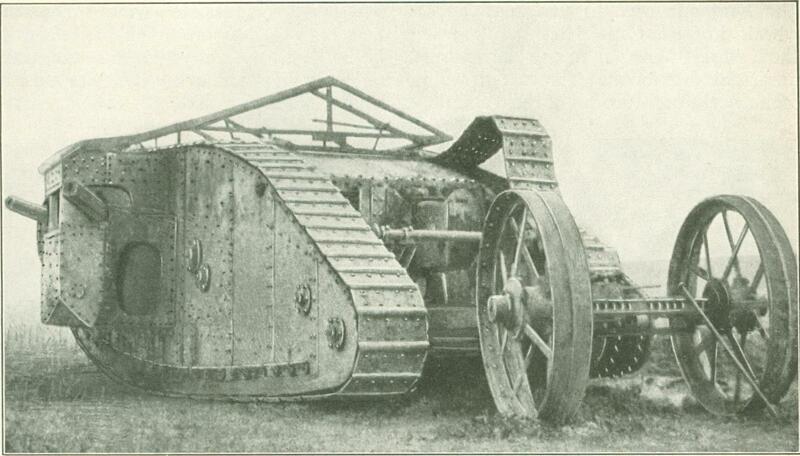 "Heavily armored motor machine guns of a new style" is the official description of the "tanks," although an eye-witness describes them as "toads of a vast size emerging from the primeval slime in the twilight of the world's dawn." And the effect upon the morale of the enemy was not, indeed, unlike that produced if some prehistoric dinosaur had suddenly appeared upon the battlefield. The great machines crawled in and out of shell craters, crossed trenches, pouring a deadly enfilading fire into them, knocked down remnants of houses that were in the way, and seemed utterly impervious to bombs and shell fire which were hurled against them. With this diabolical engine at the head of column after column of wild­ly cheering "Tommies" charging madly after it, it is but little wonder that countless "Boches" threw down their arms and hailed the tanks as "Kamerad!" And the United States authorities have been testing out the merits of the cater­pillars. 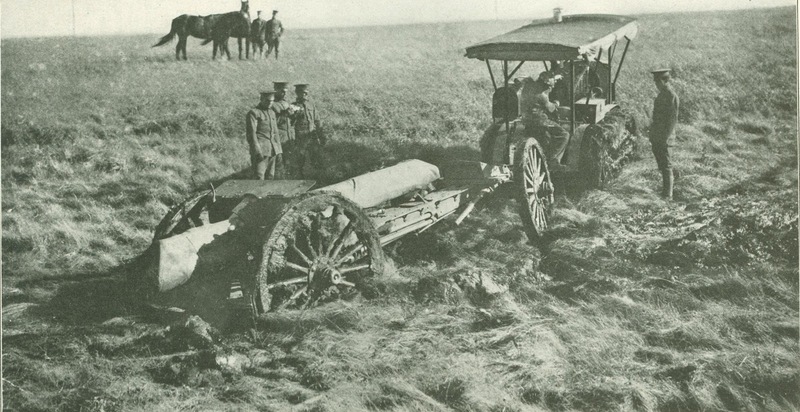 At Fort Sill, in Oklahoma, a series of tests were conducted under the supervision of the Field Artillery Board, under more severe conditions than would probably be encountered in active warfare. These tests were held with the smallest type of caterpillar, the forty-five horse­power one, pulling around a six-pound field piece, and they were so satisfactory that the Government recently placed an order for twenty-seven caterpillars for use in the 9th Heavy Field Artillery, to be stationed in the island of Hawaii. The tests were held under all possible conditions. The tractor maneuvered through sand, over fields, through streams, up and down railroad embankments, and over a railroad bridge without planking laid over the ties. In one place a tie was missing, but the caterpillar bridged the gap easily and hauled the field piece out of the hole as well. In one instance the gun and the tractor sank up to the hub in a soft, sticky clay, and the caterpillar not only pulled the gun out of the hole but, as one engineer who saw the performance aptly remarked, "pulled the blamed hole out after it," so much mud and clay was there adhering to it. It knocked down a pile of sandbags piled to the height of a man's shoulder and climbed over the debris and wound up the performance by loading it­self on a flat car from a runway. I. If the life of the tractor and trucks be taken at five years, probably too short, and the life of the replaced material and ani­mals at ten years, probably too long, the cost of the former would be less. 2. If the saving of forage were spent for fuel and lubricants the battery could travel thirty miles a day for the whole year. These facts speak for themselves!